Apple in an official document at its developer portal has now outlined the long and painful process that users need to go through in order to downgrade their Apple Watch from watchOS 2 beta back to watchOS 1.0.x. 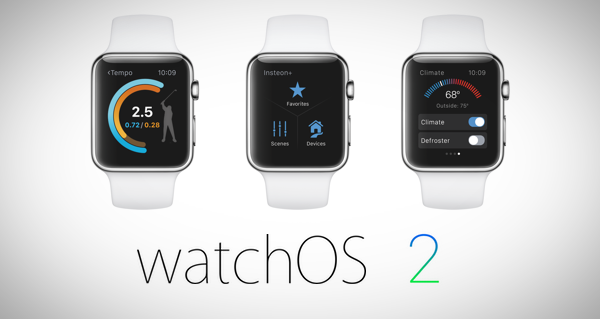 When Apple released first watchOS 2 beta last month, those who updated quickly realized that there was no way to downgrade back to latest stable public release of watchOS. The likely reason for that is the unique update mechanism that Apple Watch uses to install OS updates. But with the release of watchOS 2 beta 3, Apple has published (Apple Developer account required) a new document which details the route one needs to take in order to revert back to the current public release of watchOS. The process requires user to send in the Apple Watch to Apple and allow them to perform the downgrade. The company also notes that both Apple retail stores and Authorized Apple Service Providers are unable to comply with this request. Instead users in USA, UK, Australia, Canada, France, Germany, Italy, Japan, Spain, Switzerland must send in the device to Apple via Apple Support for downgrading. While this process is no where as easy as downgrading iOS betas on iPhone, iPad and iPod touch devices which users can do themselves using iTunes, at least there is now some official way of getting an Apple Watch running beta release of watchOS back to last public release. So if your Watch is stuck on watchOS beta, here’s what you can do to get it back to last public release of watchOS. Step 1: Navigate to this Apple Support page. Step 2: Select ‘Apple Watch’ as shown in the screenshot below. 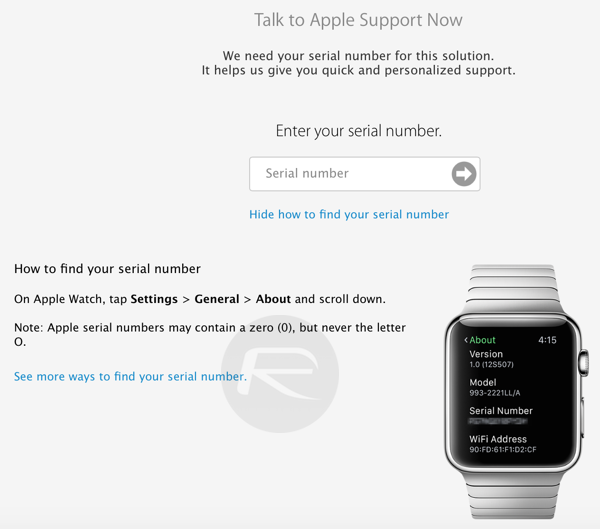 Step 6: Click on ‘Talk to Apple Support Now.’ Enter your Apple Watch’s serial number and hit enter to continue. 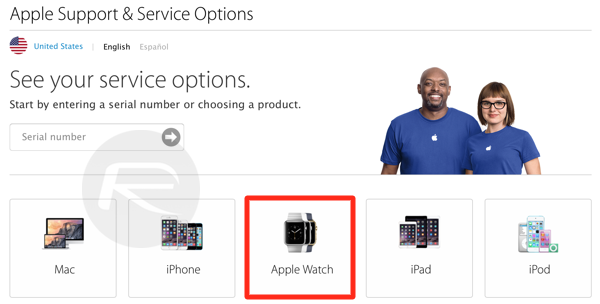 You will be required to ship the Watch to Apple for service. Apple will take a minimum of 3 business days after they receive your device to complete the downgrading process, after which it will be shipped back to you. 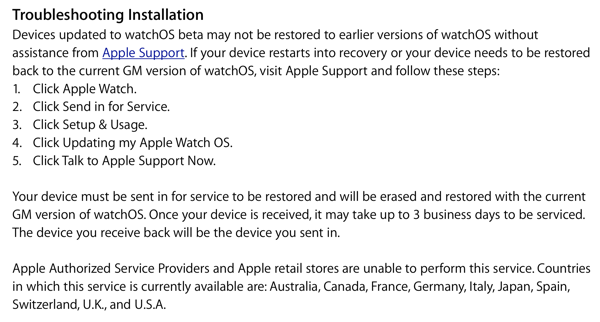 It is important to note here that the Watch you will receive back will be the exact same unit you sent to Apple, but this time with the OS downgraded to current GM version of watchOS. This won’t be a device replacement. While this information is currently available to only those who have access to Apple Developer site, there is no reason why non-developers can’t make use of this as the Support page linked in step 1 above is open to public. It’s not yet clear though whether Apple will charge anything for this service. Wow, is beta 3 worth updating now or should I still wait? The most trustworthy սոⅼοсking site I’ve ever use for AT&T phones is just google atttiphoneeuunlocking, never took us more than 6 hours to սոⅼοсking any one of my l0cked devices, we are able to ՍΝᏞΟᏟΚing the newest 6S and 6C as well. After having gone through all of the Watch OS 2 betas, I have to recommend against ever installing a watch beta again. The battery life has been terrible in all but the second-to-final beta (the one prior to the GM release). The GM release battery life is ridiculous – 4 hours sitting on my wrist while I’m sitting at work, and it’s down to 35% power. Absolutely wait. I didn’t have many issues with the actual watchOS 3 beta, but had more issues with iOS 10 on my iPhone. And in case you’re wondering, watchOS 3 requires iOS 10 and cannot be used with older versions. Currently chatting with Apple about sending my device in to restore. I learnt this the hard way too. Watch OS 3 feels pretty solid for an early build, but iOS 10 is very rough around the edges.